Classic steak and potatoes is ready in minutes thanks to these quick kabobs. Cut potatoes into 1-1/2-inch pieces. Place in microwave-safe dish; cover with vented plastic wrap. Microwave on HIGH 6 to 8 minutes or until just tender, stirring once. Cool slightly. Combine sauce ingredients in 1-cup glass measure. Microwave on HIGH 1-1/2 minutes, stirring once. Cut squash lengthwise in half. Cut beef steak and squash into 1-1/4-inch pieces. 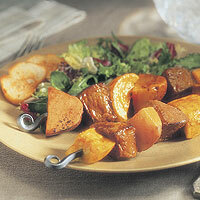 Combine beef, squash, potatoes and 1/3 cup sauce in large bowl; toss. Alternately thread beef and vegetables onto metal skewers. Place kabobs on grid over medium, ash-covered coals. Grill, uncovered, about 10 to 12 minutes for medium rare to medium doneness, turning occasionally and brushing with remaining sauce during last 5 minutes.